On November 2, 2016, the IRTG Diversity's PhD researcher Xymena Wieczorek defended her thesis on ""Patterns of (Im)Mobility: Revisiting Migration through Biographical Experiences in Canada and Germany" (Supervisors: Martin Endreß, University of Trier / Barbara Thériault, Université de Montréal). The IRTG Diversity wholeheartedly congratulates Xymena Wieczorek on her achievement. 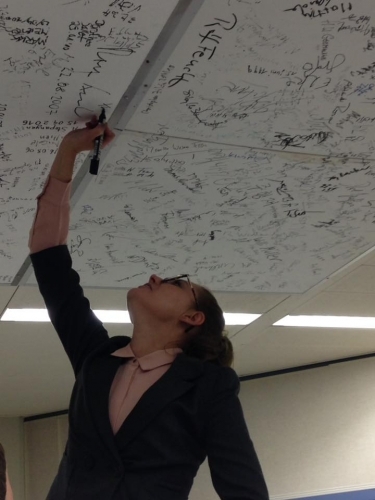 The picture depicts Xymena Wieczorek as she signs the ceiling of a room where other PhD researchers have also signed their names after successful defenses.